Denison, the largest town in Crawford County also serves as the county seat. Denison offers a variety of stores to meet the needs of the whole family. Denison also offers a wide variety of medical facilities. Five doctor's clinics as well as a newly remodeled Crawford County Memorial Hospital are available to meet the needs of the citizens. Several specialists in various fields come from larger cities to CCMH for clinics. The county is also covered by an ambulance service from the hospital. Several activities are available for the whole family. They include: an eighteen hole golf course, tennis courts, a health club. Little League and soccer for boys and girls. An aquatic center with indoor, outdoor pool, and two water slides has been an asset to the community. The Midwestern Players, a local group of actors, present several plays a year. Denison is the only city in Iowa to have a Job Corps facility. WESCO Industries is a facility that enables handicapped residents to stay close to home. 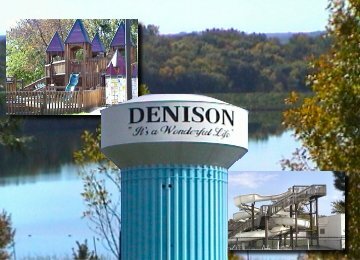 There are eight parks located in various sections of Denison with playground equipment and shelter houses. Bowling, dance, gymnastics, Tae-Kwon-Do, car races, and adult athletic leagues are available for all residents of the county. Community churches: Assembly of God, First Baptist, First United Methodist, Jehovah's Witnesses, Our Savior Lutheran (Mo. Synod), Pioneer Southern Baptist, R.L.D.S. (Latter Day Saints), St. Rose of Lima Catholic, Trinity Episcopal, United Presbyterian, Wesleyan and Zion Lutheran Church (Mo. Synod).